I've known for some time that Steve Ditko and Robin Snyder have been publishing new Ditko comics over the past few years, but it became harder for me to buy these comics once they stopped being listed in the Diamond catalog. It seems the only way to get them now is through mail order or at one of the few comic-book stores that carry them. Steve Ditko's 32-Page Package ("Tsk! Tsk") (2000), a collection of illustrated essays. The Avenging Mind (April 2008), a collection of (mostly) text pieces dealing with topics such as current Marvel Comics, Stan Lee, Martin Goodman, and examinations of what it means to "create" something (with special attention given to Stan Lee's various and contradictory accounts of his and Ditko's role in the creation of Spider-Man and Dr. Strange). It's the last two I'm interested in reviewing here; both are 32-page black-and-white comics featuring mostly stories told in a traditional comics format, along with some illustrated editorials or examinations of the ideas that Ditko's traditionally been concerned with. It makes sense to review these two together, Ditko has this odd habit of splitting stories between books, publishing for example the first four pages of a story in ...Ditko Continued... and then publishing the conclusion (pages 5 to 8) in Oh, No! Not Again, Ditko! (I don't find serialization by itself to be odd, it's the brevity of each installment that makes me wonder why couldn't each story be published complete in a single comic.) Also, some stories in ...Ditko Continued... are conclusions to stories apparently originally began in Ditko, etc..., a comic I didn't find at Jim Hanley's store. 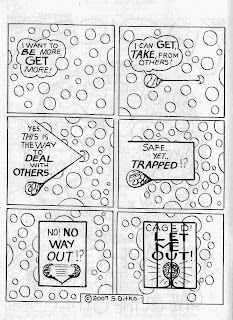 Reading the comics, one thing that immediately stands out is the minimalistic approach to storytelling that Ditko uses. Each panel contains the minimal information needed to carry the story and explain the motivation for each character. One gets the impression that complete sentences are barely used here, the dialog frequently consists of only fragments of sentences or simple descriptions of actions (some examples of all the dialog featured in three single panels from different stories: "...try a long shot...", "...a drink, relax... count my earnings...", "that's it... hear voices..."). The artwork is also quite clear, some pages are elegantly designed, but there's little unnecessary detail in them. It's as if Ditko at this point didn't feel the need to bother with all the trappings of a standard "good vs. evil" story (or in many cases, "evil hoist by its own petard" story); there are no captions, no unnecessary supporting characters, very few backgrounds, no effort (as in traditional superhero comics) at creating an unbelievable situation and then trying to convince us of its believability through repetition and the gradual accumulation of details. All that stuff would interfere with the message, with the point of the story. In a similar fashion, characters either have no name, or just the briefest of names needed to identify them. Ditko's new hero is simply called "The Hero", another one is just called "The Cape" (and he consists of just that, a floating cape; no face, no body). Villains are called "The Fist" (he has a gigantic fist) or "Force" and "Violence". Heroic characters have only one facial expression, looking with serene detachment; "evil" or "corrupt" characters' faces on the other hand go through several contortions throughout the story: from happiness to worry to fear to incomprehension in some cases ("Why? I'm an honest man... doesn't make sense.. white ... grey ... black !?") or frustrated acceptance of their fate in others. There are also a few one-pagers scattered throughout these comics, these can be similar to old-fashioned editorial cartoons (heavy on labels and simple symbolism), or diagrammatic examinations of ideas (one example shown below). I admit I particularly enjoyed the sequences Ditko devotes to comic-book fans. Fans as shown here are arrogant, whiny, selfish, and parasitic; complaining when Ditko doesn't meet their expectations (which seems to be always). The thing is, Ditko's right. These fans exist and I've seen them in various message boards and mailing lists. One thing is to disagree with Ditko's philosophy, dismiss some of his ideas, or criticize his work, but there are many fans who go beyond that and seem to be offended by the very idea of someone not living in the way they'd like him to live: Why doesn't he give interviews? Why doesn't he try to claim the rights to Spider-Man? Why didn't he negotiate a better deal? Why is he challenging Stan Lee's version of history now and not fifteen years earlier? I love the idea of this 81 year-old man thumbing his nose at his detractors and not doing the slightest effort to accomodate them or justify his actions to them. 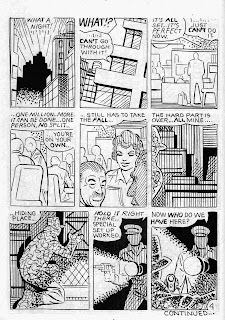 And one story in particular, "Habitual Means to Ends" (sample page shown above), with its depiction of a backstabber who constantly excuses himself by saying he's sorry and that he will not do it again, reminds me of Ditko's account in Steve Ditko's 32-Page Package of how Stan Lee gladly takes complete credit in interviews for the creation of Spider-Man, then corrects his version and credits Ditko ("I write this to ensure that Steve Ditko receives the credit to which he is so justly entitled"), only to once again take complete credit for the character, and so on. All in all, I wasn't disappointed with these comics. They can be simplistic and repetitive at times, but they do contain some surprises, some good old-fashioned Ditko fighting scenes (pages 6, or 13-14 of Ditko's "Hero" story are fine examples), and they even show Ditko has a sense of humor (something that's almost always omitted in the usual accounts of Ditko as a recluse which doesn't give interviews). I'm glad he's still doing his eccentric comics for the very love of it, and I look forward to reading more of them as they become available. I really enjoyed your post. I think Ditko's recent books (and how great is it to be able to say that he's creating 'recent' books!) have been wonderful works of art. I agree with pretty much everything you stated. Very thoughtful piece. These comics are pure artistic expression. I love the completely spartan production design (b&w art, newsprint, minimal computer lettering etc). And the parade of short stories, while they can be a mixed bag of content, are literally stripped down to pure cartooning, as you mentioned. Whether it's one of Ditko's 5 pg. comics, or a one-pager, he's really created a type of editorial-style storytelling format. What some dismiss as same-old-rant, I look at as pure, personal expression. And as you mentioned, look at the fight scene between Hero and Villian (after a century of superhero comics, someone finally did the obvious and used those two names!!). The inventive Ditko artistry is still there, even though the hands drawing the images are now in their 80s. You have to order the latest book, DITKO PRESENTS, directly from Snyder! There is a story in there with a new character, Miss Eerie, that's one of my favorite strips from Ditko in years. Where has Ditko been keeping this character? What a wild concept and execution he pulled with that one. Sorry for taking up so many bytes down here in the comment section! I just wanted to share my thoughts on your post, and talk a little Ditko. Good post, Rodrigo. You've convinced me to take a look at some of these. I don't have any real opinion on Ditko's stances on his issues, but neither have I felt compelled to follow them. 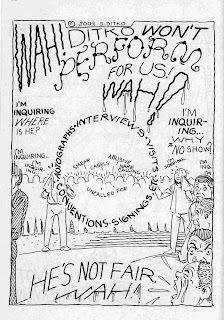 I did buy the new Ditko compilation from Fantagraphics at SPX last weekend tho. What a excellent piece on Ditko, and thanks for the insights on his new works, as I'm afraid I didn't even know they'd come out-one of the non-benefits of living in rural New Zealand is not exactly always keeping up with new publications. Nice indeed to see some sample pages and I hope I can now track down some hard copies.